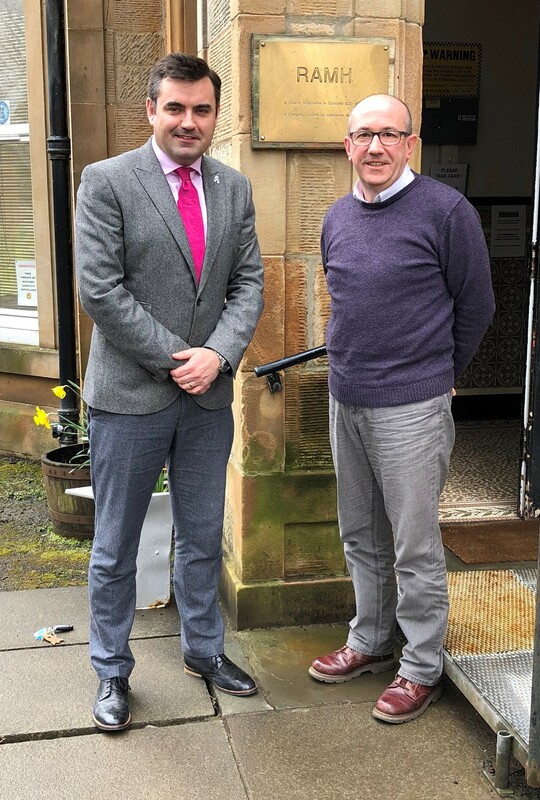 Gavin Newlands, SNP MP for Paisley and Renfrewshire North, has used part of his Easter recess to meet with the staff at RAMH (Recovery Across Mental Health), in Paisley. Mr Newlands recently met with Stephen McLellan from RAMH to find out more about their latest work to support people with a mental illness, and also to congratulate them on recently being named as ‘Employer of the Year’ at the Provost’s Community Awards. “In preparation for Mental Health Awareness Week taking place between the 14th and 20th May, I have met with a number of Renfrewshire-based groups who help support people who are suffering from poor mental health. “1 in 4 people in Scotland will experience a mental health problem this year and it’s clear that we need to do more to support people who suffer from mental ill health. “I enjoyed catching-up with RAMH to find out more about their latest work. RAMH are well known in Renfrewshire and for the past 40 years have helped people to recover from their mental ill health.